No, science fiction has not come to economics. The earth is not standing still; it just seems so to some... Over the last four months back to August, German economic climate has hardly changed. Confidence in Italy is stuck for the last two months. Confidence in France is stuck for the last two months. Confidence in the United Kingdom is stuck for the past two months. Does anyone see a trend here? Confidence levels in Italy and in Germany are stuck at relatively high levels. Confidence in France is stuck just above its median. Confidence in the U.K. is stuck below its median and below average by about 7.7 points. So there the similarities end. But the fact of confidence being stuck remains a common denominator. Consumers get confused then economic signals begin to shift and that is in process now with EMU economic data showing a clear move lower for growth and output and yet with the ECB sticking to its plan to begin to unwind its excess stimulus. So which is it? Is the economy strong enough for the ECB to leg out of its stimulus pajamas and prepare for a normal day at the office or does the economy still need some that 'special help? And if the economy is all that solid, why are the Markit PMIs withering so fast? Why are their readings so low by the standards of the last four and three-quarter years? For Germany, what is interesting is that current economic measures continue to be quite solid and even quite strong even with the flaws in some of the recent Markit diffusion readings and in other manufacturing-sector oriented readings and especially in those that are forward-looking such as the survey from ZEW or the IFO's expectations measures. But consumers consistently do not seem affected by any of that. German consumer confidence has been solid and strong on the back of a still extremely low unemployment rate. Assessing trends back to 1991 among the earliest EMU members, only Luxembourg and Austria have unemployment rates above their medians today (and of course also Greece if we include it as an 'early member' and take its data on a two-month lag). 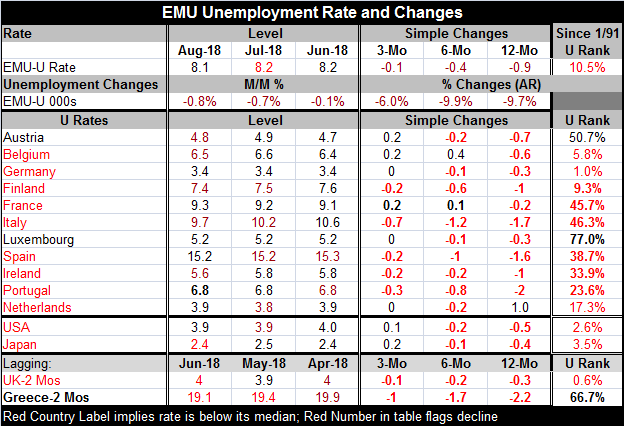 For the EMU as a whole, the unemployment rate on this timeline has been lower only about 10.5% of the time. Of course, that metric is heavily influenced by Germany whose unemployment rate on that timeline has been 'this low or lower' only 1% of the time and continues to sit on its cycle low rate. The EMU-wide unemployment rate standing ranks low, in its bottom 15th percentile along with Belgium, Germany, and Finland. For EMU members, it scales up from there to the Netherlands (17th percentile), Portugal (23rd percentile), and so on, with Ireland and Spain in their 30th percentile deciles and with Italy and France both in their 40th percentile deciles. While low unemployment and the prospect of unemployment staying at current levels or moving lower is a very important component of consumer sentiment, France and Italy have very different sentiment standings and yet quite similar unemployment rate standings. In some ways, French pessimism is surprising and Italian optimism is even more surprising. For now unemployment rates continue to fall across the euro area, but that process has been slowing down and become exceptionally erratic over the most recent three months when the unemployment rate fell in only five of the early 11 EMU members (Finland, Italy, Spain, Ireland, and Portugal). For most of the hard-core EMU countries, the unemployment rate either did not fall over the last three months or rose (Austria, Germany, and the Netherlands with Finland as an exception). The unemployment rate trend is suggestive that the consumer confidence/sentiment trends may be at a turning point or at least at an inflection point. If ECB policy is going to begin to shift gears to be less accommodate at the turn of the year as it now plans, that will happen with French and Italian unemployment rates only marginally below their respective medians of the last 17 years and it will mean that their unemployment rates are unlikely to go down much more as ECB policy turns toward normalcy. Central bankers strut their stuff including their confusion Still, central bankers have their biases, hunches and - worst of all - their reputations to pay attention to and to protect. Some even have a firm grasp on dogma and pursue it stalwartly even though that dogma doesn't hunt any more. Inflation remains contained everywhere. You cannot make it or import it. The Bank of Japan has been doing its best to manufacture some to no avail for over a decade. The U.K. trashed the pound and only was able to generate a whiff of inflation that hovered and then disappeared quickly. Inflation has the half-life of an ice cube on hot summer day in downtown Singapore (80 miles from the equator). Money and credit growth, traditional determinates of inflation, remain muted globally despite everything central banks have done. Yes! Central banks have exploded their balance sheets with little impact on money and credit. Part of that is because the focus has shifted from laissez-faire monetary policy to aggressive regulation of banking and tight enforcement of banking sector rules. Yet, even central bankers fail to appreciate the impact of what they have done here. For now we have to say that Keynes trumps everyone since his framework is the only one that flashes any inflation warning and central bankers are coming to heel around it. Are they right? Or are all these shifts or pending shifts in monetary policy set to unhinge growth and getting ready to push up unemployment rates and sour consumer confidence? Enquiring minds want to know...is this prudence or madness?